Technology has made our day to day life easier and prosperous. Like all the other aspects of our life technology has greatly improved devices for having utmost enjoyment from our entertainment means. DVD players are significant ones among the mostly used devices for entertainment purposes. A lot of people all over the world are using DVD Players of various reputed brands. Simply DVD player is a device which is capable of playing both video and audio of DVD discs. These DVD discs are made from DVD-Video and DVD-Audio technology. Audio CDs can also be played by DVD players. By connecting DVD players with our televisions we can watch movies, music videos, tv shows or other favorite recorded video contents. The first DVD player was created by Sony Company in Taiwan in collaboration with Pacific Digital Company from the United States in 1997. Most modern DVD player offers great video output with ease of control. 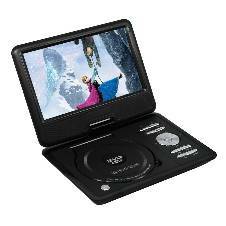 Most of the branded DVD players come with on-screen player buttons associated with on-screen menu and remote control system. Latest players also have USB port and SD card slot as well so that users can also enjoy any video contents directly from their pendrive or memory card reader instead of using a DVD disc. Some players even built in with internet activity options to play videos directly from internet. DVD changer, DVD/VCR Combo, DVD Recorders, Portable DVD Player and Blu-ray DVD players are the types of DVD players. Looking for Best Deals on DVD Players in BD?? AjkerDeal has a wide range of collection of all the necessary consumer electronic products such as television, refrigerator, computers, speakers, air conditioner, android TV box and others. Buy products with easy refund policy and relevant service warranty at the best price.